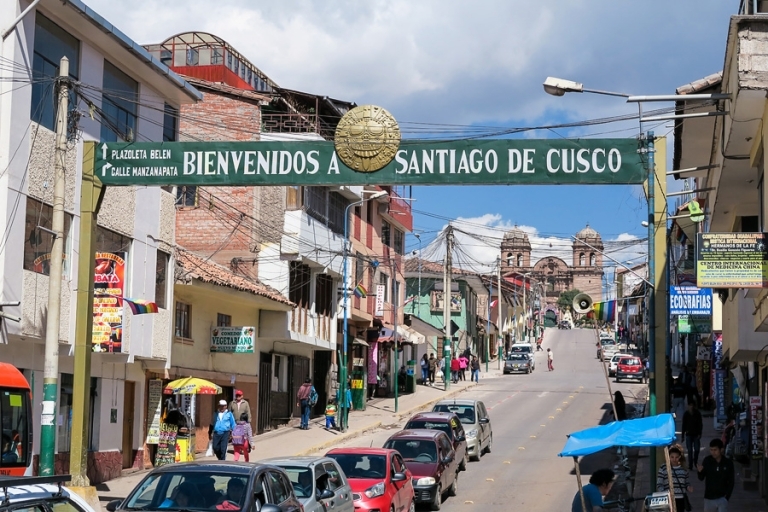 As per the advice recommended by so many sources, Chris and I spent two nights in Cusco before setting off on our Sacred Valley journey with Mountain Lodges of Peru. We also spent two additional nights in the Inca Empire capital post-trekking so that we could rest up before returning to Lima. During the trip planning process I thought about trying to get to Lake Titicaca or maybe even the Amazon, but I went with my gut which told me that we’d be tired after the trek and in need of some down time. I was right. And it turns out we needed the buffer on the way back for trip delays due to protests in the area, but more on that in a minute. We took a short flight on LATAM Airlines from Lima to Cusco and arrived to rumblings of the teachers’ strike activity affecting transportation. Sure enough, our taxi that we had booked in advance couldn’t reach the inside of the airport to pick us up. It wasn’t a huge deal – we just met the driver outside of the small airport and walked a few blocks to his parked car. After getting settled into our fantastic hotel (I’ll write more about it in a future post), we headed out on foot to explore the city’s quaint cobblestone streets. 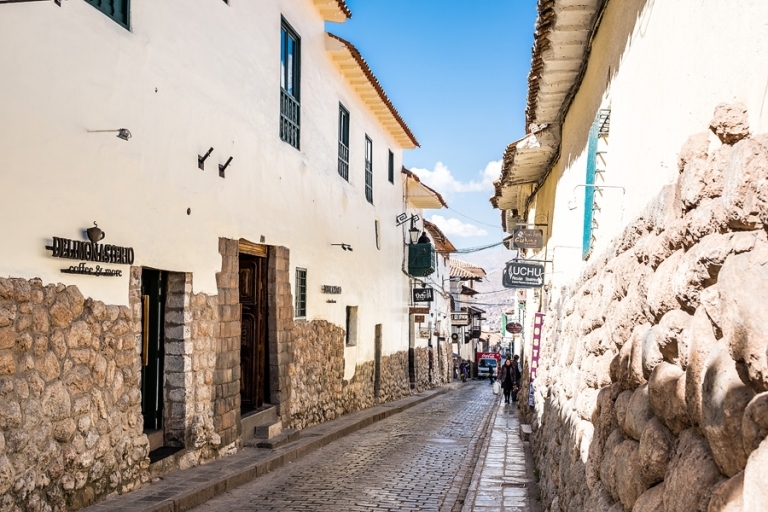 Cusco is simple to navigate and most everything is accessible by walking. The altitude took my breath away a little at the airport upon arrival, but after a few hours I didn’t notice our 11,500 feet above sea level-ness. Chris had very minor headaches every once in a while, but thankfully neither of us had true troubles with the altitude. Craving a good view of the plaza, we paid a small fee to go inside the Iglesia de la Compañía de Jesús and we headed up to the lower level of the bell tower. Even if it wasn’t my favorite bird’s-eye view ever, it was an easy climb and you can get a better look at the Cathedral Basilica of the Assumption of the Virgin (a.k.a., Cusco Cathedral). Unfortunately, photos aren’t allowed elsewhere inside of the church, but it’s an incredibly ornate interior with tons of gold and beautiful artwork, so I recommend the experience even sans camera. Speaking of places that don’t allow photos, we also spent some time at the Museo Inka to brush up on our history before heading off to the Sacred Valley. 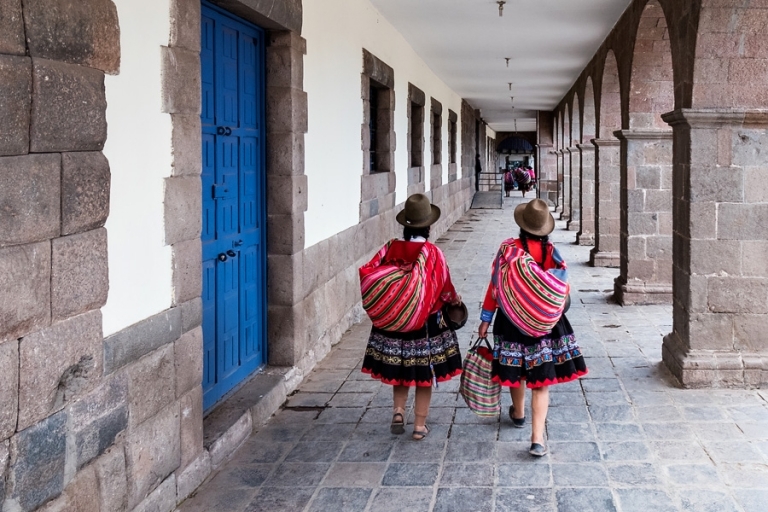 The museum houses an impressive collection of Inca and pre-Inca artifacts including tools, textiles, jewelry, pottery, and ceremonial wooden drinking vessels. There is also a big model of the Machu Picchu citadel. 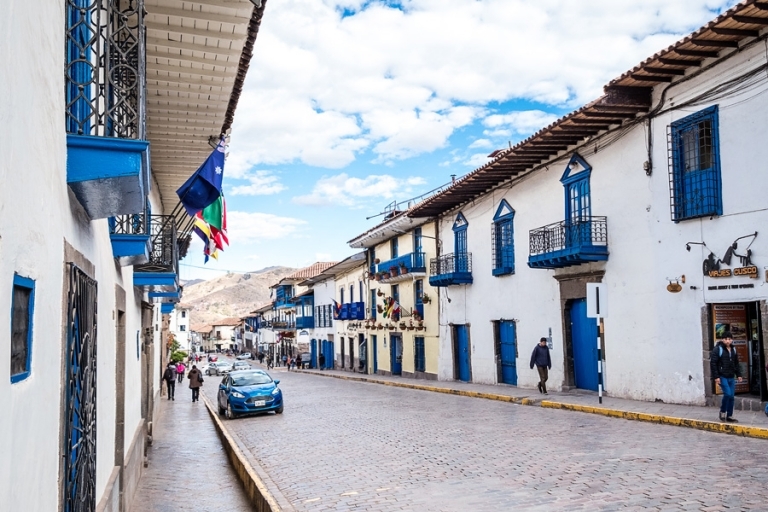 Of course, with all of the shops and markets lining the streets of Cusco, we couldn’t help but search for Peruvian souvenirs. I ended up with this Andean-style hat known as a chullo, as well as a crazy-soft throw for the house. Both were purchased at one of the stores specializing in alpaca wool. I also scored a pan flute as a nod to my musician days long ago. Back in our hotel room, I worked out a rudimentary rendition of Mary Had a Little Lamb. While we did listen to the advice to acclimate over the course of two nights in Cusco, we ignored the advice to eat light and avoid alcohol. Oops. We ate and drank quite a bit in Cusco, though perhaps slightly more cautiously on our first two nights as opposed to our second time passing through. While we ate mostly Peruvian cuisine during our time in Peru, we ended up celebrating July 4th over burgers with American cheese at Papacho’s. And for dessert we checked off my wish-list item to try alfajor cookies with a Papacho’s alfajor sundae. YUM. One of the things we loved about our hotel was their happy hour nights with pisco sours and a Peruvian treat similar to a donut called picarones. I don’t think I’ve ever found a fried dough I didn’t love, and these were no exception. We also found various Peruvian beers to sample at Qosco Beer House, which was a fun spot to sit on the deck outside and listen to a live local band. Chris’s favorite beer on the whole trip, though, ended up being at La Bodega 138, a cute pizza joint around the corner from the main plaza. It was our first time trying a beer made with quinoa! Our second time coming through Cusco ended up being a little more dramatic than the first. Throughout the week we were in the Sacred Valley, the protests had escalated quite a bit and the transportation issues had become major. Roads in and out of Cusco were blocked with large boulders, parked cars, and an occasional fire. The policia were out in full force with riot gear should the crowds become violent, but Chris and I only witnessed peaceful marches (and the boulders in the road) despite news that protesters had resorted to violence in other areas. The plaza and surrounding streets filled with protesters supporting varying causes. 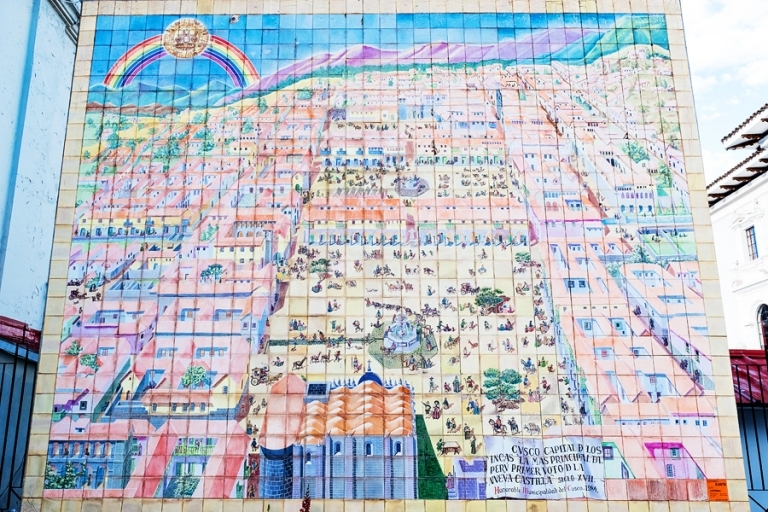 Our understanding is that the original teachers’ strike was still ongoing at this point, but that they were also joined by citizens upset over the planned Chinchero airport. No worries though. This security llama was on the job. By the time we returned to the Plaza de Armas in the evening, all was calm and the crowd had dissipated. We did have to take an extra early taxi to the airport the morning of our 11:45am return flight to Lima to ensure that we could get around any road blocks. Based on social media reports, it sounds like if we had waited to go to the airport later that day, we would have been trapped in Cusco! Leaving before sunrise did the trick since the protesters weren’t active yet and we made our way back to Lima. Good citizens were out moving the boulders in the road and our taxi just had to maneuver around a few remaining obstacles. Sadly, we didn’t make our way up to Sacsaywaman or over to the Coricancha as originally planned. We had saved a couple of sites for our second visit coming back through after the trek, but by the time we were back in Cusco we were exhausted. The protest-related delays getting us out of Aguas Calientes put us back at our hotel shortly before Midnight and we ended up taking the following day to rest and repack, thus we skipped any legit sightseeing during our last moments in Cusco. But I’m happy to have a good reason to return! Up next: the whole reason for our trip – our adventure with Mountain Lodges of Peru!